Charles William Waudby was born in Leadenham c1893. His father, William, was a farm foreman so the family seemed to move around frequently. In 1901 they were at The Hilltop, Rowston St Clement. By 1911 they were at Bloxholm Moor, Dorrington, where Charles (18) was a farm labourer. Charles enlisted in 2nd Battalion Lancashire Fusiliers in May 1916 at Grantham, later moving to 20th Battalion. He was sent to France in Sep 1916 and on 10th October he was wounded in the head during the Battle of the Somme. 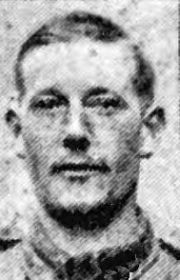 He was wounded again later in the war and then (by now with 2/7th Battalion) he was captured by the Germans on 21st Mar 1918 (the same day that Alfred Charles was killed). As a POW he was forced to carry ammunition for the Germans and was badly treated. By the time he was recaptured by the British on 8th Nov he was starving. He returned to the UK on 21st November and admitted to the King George Hospital in London, suffering from dystentary and starvation. He died on 5th December (age 25) and was buried at Caythorpe the next week. Charles’ younger brother John married Amy Pheasant (of Caythorpe). Her parents were Thomas and Mary Anne (nee Speed). Mary Anne Speed was the daughter of William Speed’s younger brother Thomas (born 1834). John died in 1941 and is buried at Caythorpe.